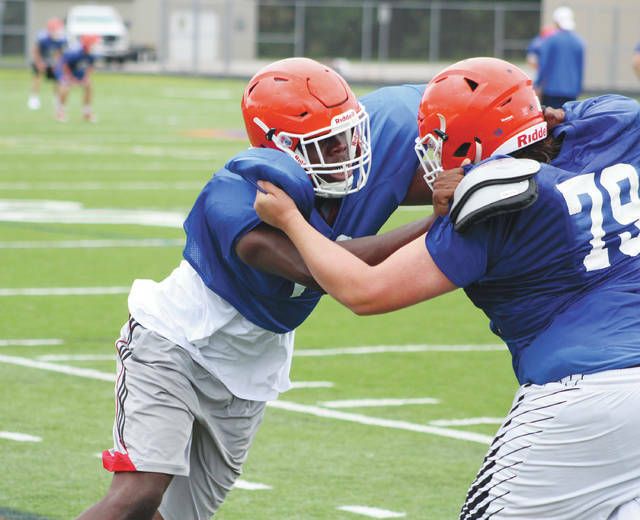 Olentangy Orange lineman Zach Harrison, left, works against Jared Pack during a practice earlier this summer. 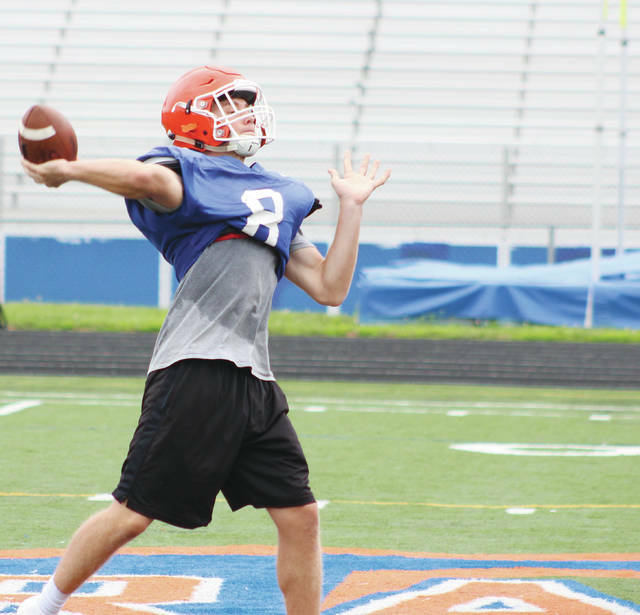 Senior quarterback Robbie Dayhuff will look to pick up where Luke Schmeling and last year’s offense left off when the season gets underway. Aug. 24 — Vs. Worthington Kilbourne, 7 p.m.
Aug. 31 — Vs. Bishop Watterson, 7 p.m.
Sep. 7 — @ Pickerington North, 7 p.m.
Sep. 14 — Vs. Big Walnut, 7 p.m.
Sep. 21 — @ Westland, 7 p.m.
Sep. 28 — @ Westerville North, 7 p.m.
Oct. 5 — Vs. Olentangy, 7 p.m.
Oct. 12 — @ Westerville Central, 7 p.m.
Oct. 19 — @ Olentangy Liberty, 7 p.m.
Oct. 26 — Vs. Westerville South, 7 p.m. When Olentangy Orange football coach Zebb Schroeder talked about building a football program before the 2015 season – he pointed to his lines. “We have some very good big kids – we just don’t have very much depth at the offensive and defensive lines,” he said at the time. Fast forward three years later and the Pioneers are replacing a lot of skill position players on offense and much of the back end of their defense. They lost Bryce Houston, Zane Fisher, Jimmy Sensibaugh, Garrett Runyon and Jayden Rodgers – all key cogs on a defense that held opponents to just 13.3 points and less than 250 yards per game. They lost their top two leading rushers in Jack Applegate and Graham Starn, quarterback Luke Schmeling and his top target Manny Anderson on offense. But, Schroeder (22-20 in four seasons) has a lot of linemen at his disposal – making that transition a whole lot easier. One of those linemen is one of the top recruits in the state, if not the country in Zach Harrison. The star defensive end had 17.5 tackles-for-loss and 7.5 sacks as a junior last year. He’ll also contribute more on offense at wide receiver – a position he’s played in the past. Junior Jeff Sullivan (center) and seniors Zach Stevenson (guard) and Ryan Duffy (tackle) return to play on a very strong offensive line. They’ll be protecting Robbie Dayhuff (senior) at quarterback and running back Mark Roberts (senior). The defense has a lot to replace for sure, but senior Brant Kightlinger and Kyle Sessaman join Harrison on the line. Zach Hill moves off the line to linebacker and Dayhuff and fellow seniors Ethan Adkins and Brad Snyder should shore up the secondary. The Pioneers are coming off their best record in school history at 11-2 overall. But, their season hinged on just two points. They were a point away from winning the OCC Buckeye (their first league title since 2011) and finishing the regular season undefeated for the first time in school history. They were a point away from picking up the school’s second ever playoff victory. Even with all of the changes – Schroeder believes he’s seen that this group has the ability to keep the momentum rolling.